Compatible with: iPhone 3GS, iPhone 4, iPhone 4S, iPhone 5, iPod touch (3rd generation), iPod touch (4th generation), iPod touch (5th generation), and iPad. Optimized for iPhone 5. 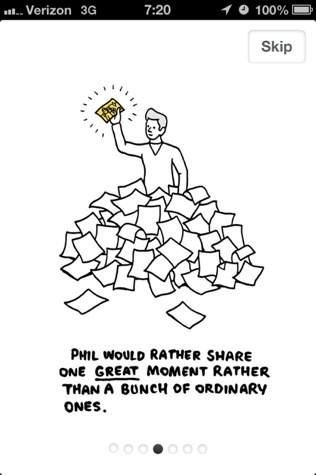 If you’re feeling overwhelmed with social media, and especially photo sharing, PicIT24 has an idea for you. What if you could only share the best photo and thought of the day? What if your friends/followers were limited to the same? Only one photo. Only one quote. Once a day. PicIT24 is a response to the tidal wave of incoming information that many of us suffer from. Rather than watching a stream of text and photos go sliding by, PicIT24 allows folks to share only the day’s best. As a user, it forces you to think before posting, delay your decision until later in the day, and be intentional in what you share. The app greets you with a summary of the daily contributions of users. A grid of photos or quotes or both is front and center, along with the date and a timer of how long you have remaining to get your own contribution posted today. Alternate views include the top pics of the day/month/year/favorites or the pics of people you follow. 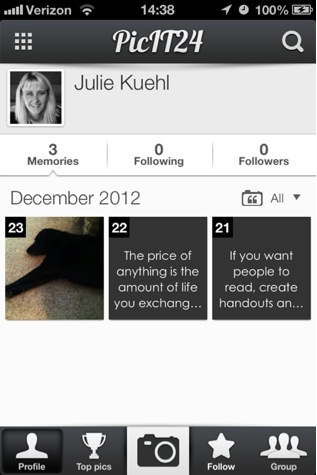 You can also view pics/quotes sorted by groups you’ve created such as friends or family. When you’re ready to share a photo, you only have access to your Camera Roll or taking a fresh pic to share from your iPhone. No fair accessing your other photo folders and pulling pics from previous days. There are also a handful of filters that you can choose from if you so choose, and you can add a caption to the photo that doesn’t count against your quote quota. If you’re adding a quote, you can type it in directly, or copy and paste from another location. The app is serious about the one contribution a day restriction. There is a countdown clock on the main summary screen to show how much longer you have to get your daily image or quote entered. And it will send you a reminder late in the day (it was 6 p.m. for me) to get your submission in. The free iOS app syncs with PicIT24‘s free website to give you lots of options to manage and contribute. (If you do want to use pics taken previously, this is your workaround.) The website offers essentially the same functionality as the app. I don’t think PicIT24 is going to replace Instagram or Flickr, but it may have its own niche for recording and sharing on a more intentional basis. It would also make a nice diary to share with others — I’m looking at you college students and travelers.